Love the mailbox - very creative 😃 All the stationery is beautiful too. I wish I could be half so artistic. Great blog and thank you for sharing. Gosh! What lovely! I am so proud of you because you are my countryman! Wonderful, colourful cards. Zo zie ja maar Ellen, creativiteit wordt gewaardeerd! Leuk stukje Ellen, om trots op te wezen. 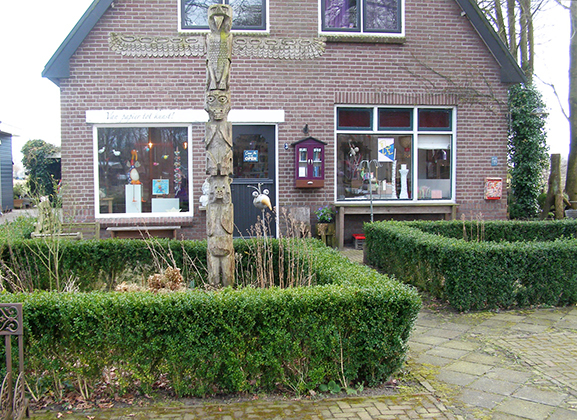 Mooie kaarten en leuk om je eens te zien! Beautiful cards, lovely mailbox, nice interview. Thank you so much, Ellen! So fun! Thank you for sharing your art and vision! 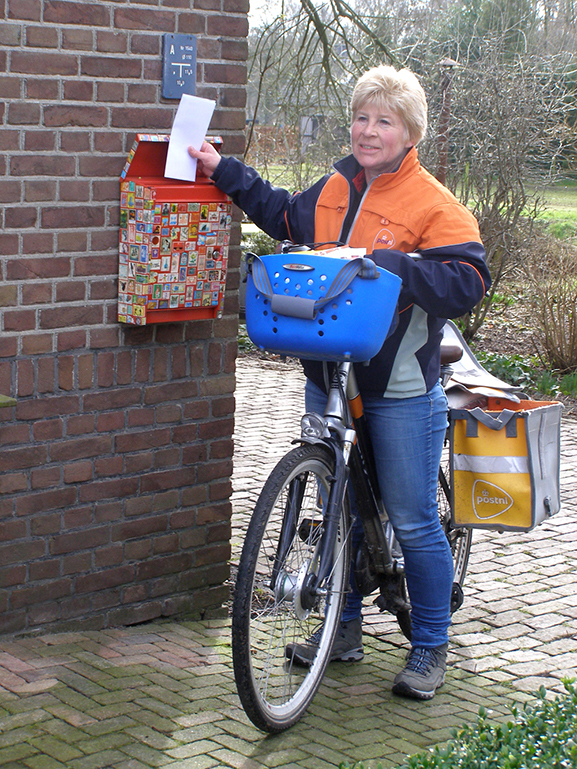 Love the mailbox :) Wish I had one like like that as well. I am not an artistic person at all. Great cards as well! I love this story! Is that also a "Little Free Library" on her front wall? Beautiful postcards! I would be very happy to reveived such a postcard. 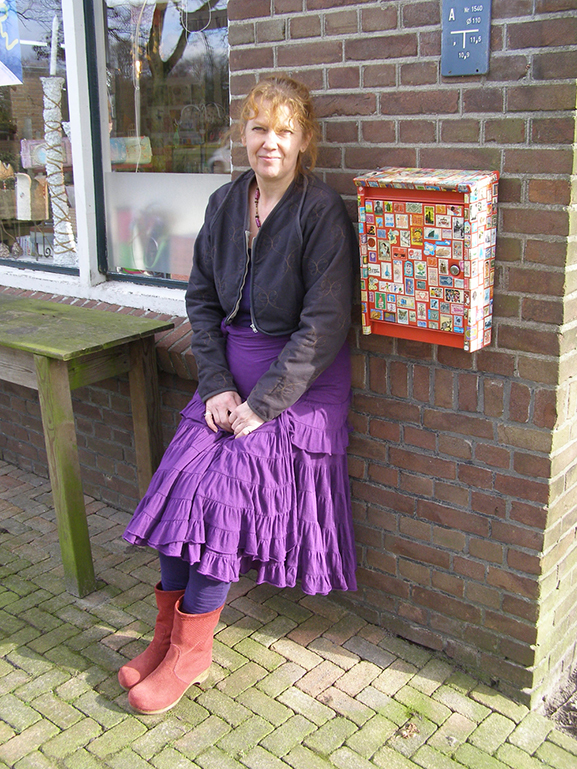 What ajoy to see your postcards, Ellen! El'Paper is very interesting. I love to find these creativity around... Congrats and keep bringing up more postcards!!!! Lovely mailbox. the totem pole...is that yours as well? I love to share this with you! Beautiful artwork, I'm glad my profile says I like handmade cards. Hmm, might steal this idea for postcard boxes. What a wonderful PXer! Ellen, your work & your life are magical. We're lucky to cross paths with you! Thanks for this delightful post. 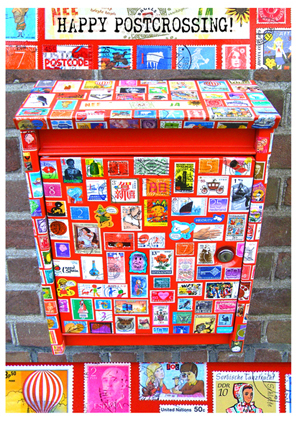 I found postcrossing through Flow magazine too (a little pricey but worth it) - love the mag and love this post box! 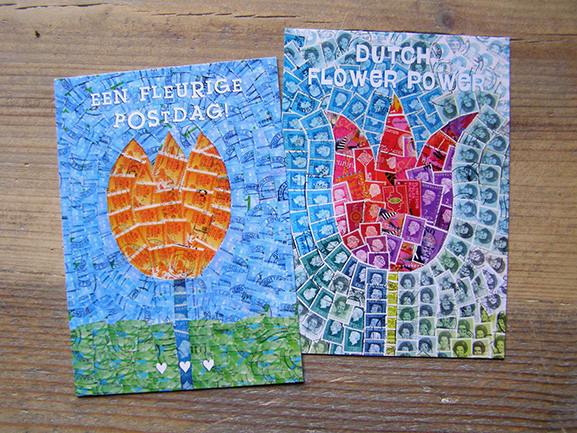 Many people says "don't send me handmade postcards"... they don't realize the cand be ART and lovely!! Thaks for sharing! Beautiful! Thanks for sharing your talents with us! This is creative and fascinating! Wow! Plus one for creativity! Your postcards and your mailbox are lovely. Very creative and I'm loving it. I love working with paper, too...and I recently received one of the above pictured cards in the mail! Lovely Postcard, great article! Bravo, Ellen! I love your imagination & your talent. I will try to do more UPcycling now. I have used old stamps before to cover a book, & I coated them with a brushing of clear varnish, which helped a bit to protect their colour. Maybe use something similar for that eye-catching (& postcard- catching!) letterbox?! Cheerio, alles van de beste for the Chinese Year of the Red Monkey! from Bev Braam, Sydney. Lovely! 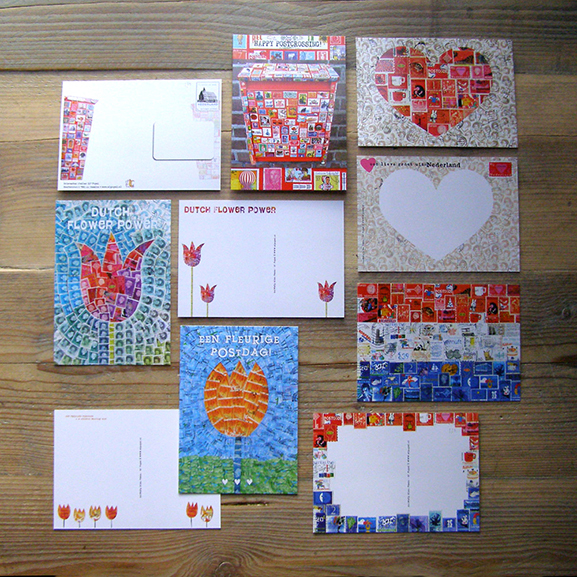 Love the mailbox and the beautifull cards! Where do you find all those stamps??? This is an awesome mailbox and you are a very creative person with your stamps and cards. Please keep up the good work! I loved your cards!!!! Do you sell them? how wonderfully colourful and creative - beautiful!! Great article, lovely mailbox! I have a lot of hand painted art hanging outdoors on my fence and also some hand painted adirondack chairs (flowers etc). The paint is acrylic. I have used a product called "Flecto Varathane, Diamond Wood Finish", gloss, outdoor...it has maximum UV protection, is longer lasting, clean up is by water. I have used it over painted wood, painted garden rocks, painted ceramics etc. Some colors like red/purple will fade faster, but in general my chairs have been in the sun for almost 12 years and the colors still look rather reasonable. It is the best product that I have found for preventing fading.